I think that a week after Ynet broke the story about a Russian military intervention in Syria we can confidently say that this was a typical AngloZionist PSYOP aimed at inhibiting the Russian involvement in the Empire’s war against Syria and that it had no basis in reality. The second item is the one which is most interesting. Needless to say, as is typical in these cases, the actual contents of the cargo Russia is sending by air and sea is not made public, but we can speculate. First, we know that Syria needs a lot of spare parts and equipment repairs. This war has been going on for 4 years now and the Syrians have made intensive use of their equipment. Second, the Syrians lack some battlefield systems which could greatly help them. Examples of that include counter-battery radars (radars which spot where the enemy’s artillery is shooting from) and electronic warfare systems. Furthermore, Russian sources are saying that Syria needs more armored personnnel carriers. Furthermore, while heavy equipment is typically sent by the sea, the Russians can deliver their air defense systems by air: The AN-124 is more than capable of transporing S-300s. That fact alone would explain the AngloZionist panic. First, on a political level, it is still exceedingly unlikely that Russia would take any major unilateral action in this war. 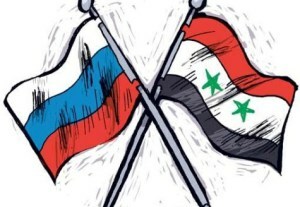 While Syria is a sovereign country and while a Syrian-Russian agreement is enough to legally justify any military move agreed to by both parties, Russia will try hard not to act alone. This explains why Foreign Ministery Lavrov is trying so hard to create some kind of coalition. The lesson for all those who resist the Empire is obvious: the hardest thing is to remain standing after the first “blow” delivered by the imperial forces. If you can survive it (as the Donbass and Syria have done), then time is on your side and the position of the Empire will begin to weaken slowly but surely because of its own internal contradictions. When that process being, you must not fall into the trap of over-committment, but gradually occupy each position (political or other) given up by the Empire in the process of the disintegration while securing your own each step of the way.